Today, most people associated the name of Thebes with the Egyptian UNESCO site, in antiquity though, Thebes was also the name given to one of the most important cities of Ancient Greece. In antiquity, Thebes was a rival to Athens and Sparta, and would normally be the antagonist to whichever of those two city-states was in the ascendancy at the time. Thebes itself would never quite make it to being the dominant city of Greece, and when it stood against Alexander the Great in 335BC, the city was destroyed. Thebes would never subsequently recover, and today it is but a small market town. Historical fact mixes with mythology though, and as with most settlements of Ancient Greece, there is a myth to the founding of Thebes; a myth that starts with Cadmus. Cadmus was the son of King Agenor and Queen Telephassa of Tyre, and was therefore brother to Cilix, Phoenix and Europa. Europa would be abducted by Zeus, and so King Agenor dispatched his sons, Cadmus, Cilix and Phoenix, and his nephew, Thasus, to recover his daughter. It was of course an impossible task, and none of the brothers would ever return to Tyre. Phoenix would stop his search in North Africa, and found part of Phoenicia, Cilix would found Cilicia in Asia Minor, and Thasus would found Thassos. Cadmus would have his own journey. Cadmus would travel across the Mediterranean, stopping off on the island of Calliste (Thera/Santorini), and then Samothrace before eventually reaching the Greek mainland. Landing upon Greece, Cadmus sought out the advice of the Oracle of Delphi about where his sister might be found. The advice given was not what Cadmus might have expected. The Oracle told Cadmus to forget about his father’s quest, and instead Cadmus was to found his own city. The location of the new city would be determined by following a cow with a half-moon on its flank, and then building where the cow laid down to rest. Departing form the oracle, Cadmus soon located the cow he was destined to follow, and with his small retinue set out in pursuit of it. It proved to be a long journey, but eventually the cow came to the area of Boeotia, and by the banks of the River Cephisus the cow came to rest. Deciding it was appropriate to sacrifice the cow to the goddess Athena, Cadmus dispatched his retinue to collect water from a nearby spring. Unbeknownst to Cadmus the spring was the sacred spring of Ismenos, a spring of Ares, and one which was guarded by a deadly serpent, the Ismenian Dragon. When his men failed to return from gathering water, Cadmus went to the spring, finding his men dead, Cadmus sought revenge upon the serpent. 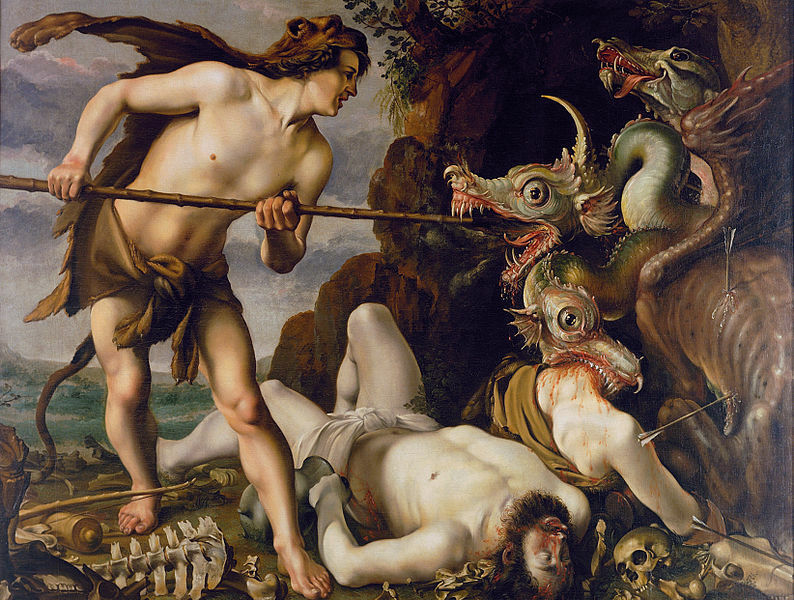 An epic fight between man and serpent ensued, but eventually Cadmus won out, killing the serpent. Killing the serpent though would cause further problems for Cadmus, and in penance to Ares, Cadmus was forced to spend eight years in the servitude of the god. In some versions of the tale the period of servitude started immediately, and in others occurred at a later date. Cadmus had discovered the perfect site to build a city, but now with his retinue dead, he had no one to build it. The goddess Athena though, would come to Cadmus’ rescue; the goddess having been pleased by the sacrifice made of the wandering cow. Athena told Cadmus to sow half the teeth of the serpent. Cadmus did as the goddess bade, and from the teeth a large number of fully grown, armed men emerged. Fearing for his life, Cadmus through a stone amongst the men, and they men started fighting amongst themselves. Eventually only five men were left. These five men would be known as the Spartoi, and it was they who would assist Cadmus in the building of the new city, and subsequently the Spartoi would become the ancestors of the prominent families of Thebes. The remaining teeth of the serpent were given to Athena, and they would eventually make their way to Colchis, and become a danger for Jason to face. Cadmus and the Spartoi would build up the city around a citadel, and the city would be known as Cadmeia. To honour the creation of the city, Zeus and Athena arranged for the marriage of Cadmus to Harmonia; although is some stories the marriage occurred on Samothrace. Harmonia was no mortal princess though, for she was a minor goddess of the Greek pantheon, being the Greek goddess of Harmony; and as such a great honour was being bestowed on Cadmus. The wedding of Cadmus and Harmonia was attended by many gods and goddesses, and the Muses were said to have sung at the wedding feast. Parallels between the marriage of Cadmus and Harmonia, and that of Peleus and Thetis are of course obvious. The marriage of Cadmus and Harmonia would bring forth a number of children. Daughters Autonoe would become mother of Actaeon, Ino who was transformed into a sea goddess, Semele, mother of Dionysus, and Agave, the mother of Pentheus, a future king of Thebes. Cadmus and Harmonia also had two sons, Polydorus, who was the successor to Cadmus as king of Cadmeia, and Illyrius, a son who gave his name to Illyria. Illyria was not born in Cadmeia, for Cadmus and Harmonia would leave the city and travel to the borderlands of Greece, where in future the Illyrians were said to live. Cadmus would assist in a tribal dispute, settling the matter in battle, and subsequently became king of the tribes in this area. Some say that it was at this point hat Cadmus, and Harmonia, were changed into serpents, although if the transformation of Cadmus had occurred at an earlier point, then it was instead said that Cadmus and Harmonia would subsequently spend eternity together in Elysium, the paradise of the Greek afterlife. As to the city that Cadmus founded, a couple of generations later, during the reign of Amphion and Zethus, the name of the city would be changed from Cadmeia to Thebes, in honour of Zethus’ wife, Thebe. The name Cadmeia would remain in use though, as it was passed onto the citadel of the city.